Faculty of Sciences is an educational and scientific institution providing teaching and scientific research within the fields of biology, chemistry, physics, mathematics, informatics, geography, tourism and environmental protection at five departments: Department of Biology and Ecology, Department of Physics, Department of Geography, Tourism and Hotel Management, Department of Chemistry, Biochemistry and Environmental Protection and Department of Mathematics and Informatics. The Faculty was established in 1969, but research in natural and mathematical sciences began long before that. Today the educational process of the Faculty is organized at primary, master and doctoral levels in the fields of: biology, ecology, environmental protection, physics, astronomy, geography, tourism, hotel management, chemistry, biochemistry, mathematics and informatics. Since 2007, the Faculty has introduced vocational studies in optometrics. Teaching process is organized in 13 study programmes. The accreditation has been obtained for 38 study groups. The studies are organized in three cycles â€� primary, master and doctoral studies providing degrees in Bachelor of Science, Master of Science and PhD. This is a very big and complex faculty comprising almost six thousand students, professors, teaching and research assistants and administration staff. Teaching is provided for about 4500 students at all levels of studies. By the end of 2010, up to 170 specialization papers, 652 master (magister) these, 517 doctoral dissertations and 326 master papers were defended at the Faculty. There are over 500 employees, out of which almost 300 are teaching and research staff. Some of our outstanding professors are members of the Serbian Academy of Sciences and Arts and Vojvodina Academy of Sciences and Arts, and they are also participating in executive government bodies of the Province, holding Rector and Vice-rector positions at the University of Novi Sad. The Faculty of Sciences, Department of Physics organizes regularly "Open days" events and trainings for teachers of physics. It supports popularization of physics through the programme of Festival of Science, Researchers Night, and Educational Fair and organizes additional information days for interested students. 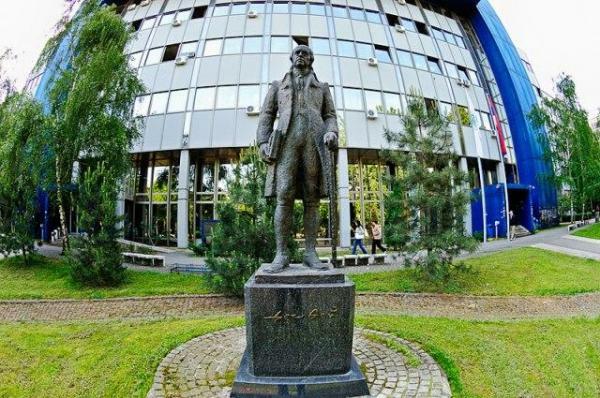 Teaching physics has been present at the University of Novi Sad since its beginnings, while science laboratories were established soon after, which means that the history of organized physics-related educational and research activities are part of the history of the entire University. The activities of the Department are organized on three levels: teaching activities, research and science activities, development and other special activities.